The 1987 Stanley Cup playoffs saw the birth of a renowned Winnipeg Jets tradition. 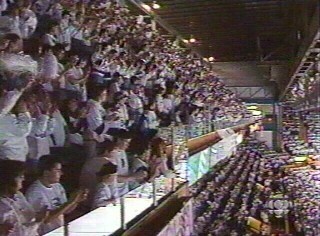 In response to the “C of Red” in Calgary, where fans were asked to come to the Saddledome wearing red, the Jets countered with a call for their fans to wear white. 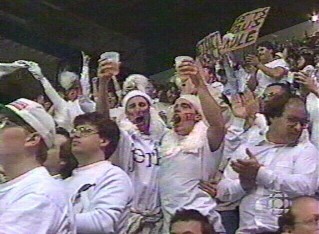 The “White Out” continued through the Jets' final season in 1995-1996 and though the fans enthusiastically embraced the ritual, the team would never again win another playoff series. A series of heartbreaking collapses plagued the Jets in front of their white-clad fans and some began to refer to the White Out as a White Curse. 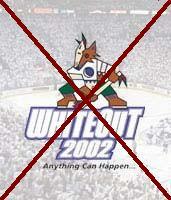 Though the Jets are gone forever, the “White Out” has taken on a life of its own. 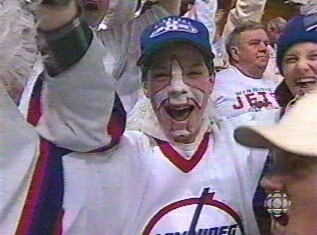 The tradition has been copied in numerous other NHL cities, but nowhere with the enthusiasm that it had in Winnipeg with the Jets. Few remember where this tradition started, but Winnipeggers can watch from afar with pride that they've at least left something positive behind in the NHL, even if only we know it. Unfortunately, much to the chagrin of many Jets fans to this day, one of the places where this tradition has been copied is in Glendale, home of the Arizona Screaming Weasels, the relocated Jets franchise. Seeing the sea of white in Arizona is enough to get any true Jets fan's blood boiling as we watch them to cling to a past that is not theirs rather than making traditions that are meaningful to them. The franchise might actually succeed once they choose to break free from a legacy of playoff failures in a place that few in Arizona could point out on a map.